This large group of perennial plants come from North America in the main. They are a woodland plant and have a history of being used as a medicinal herb as well as being attractive garden plants. They flower late in the season and with attractive yellow flowers held above the foliage make a welcome addition to the garden as summer comes to an end. S.gigantea is known as the Giant Goldenrod and will reach to around 2 metres in height. Attractive flowers that attract a range of beneficial insects to the garden as well as bees and birds. Excellent in a cottage garden where they will happily self seed they prefer a well drained soil and plenty of sun. A diverse genus related to the sunflowers. 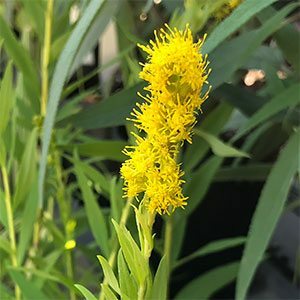 Propagation is easy form seed sown in spring, in good conditions Goldenrod species will self seed and may need to deadheaded in some gardens.